A mix of clouds and sun. A stray shower or thunderstorm is possible. High 87F. Winds SSW at 10 to 20 mph..
Clear this evening. Becoming mostly cloudy with showers developing after midnight. Thunder possible. Low 72F. Winds SSE at 10 to 15 mph. Chance of rain 50%. 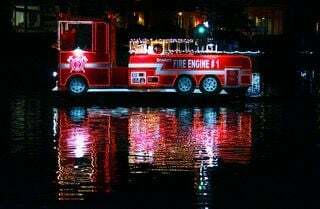 A pontoon boat, transformed into a fire truck, makes its way down the canal parade.route. 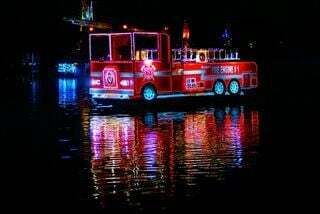 HERALD PHOTO BY JERRY BEARD The pontoon boat disquised as a fire truck, continues to make its way down the lighted boat parade route. Prepared to “launch,” this rocket made of lights, sits atop a boat. HERALD PHOTO BY JERRY BEARD “Santa” sits on the deck of the “Sea Eagle” awaiting its turn to join the parade. Mary Crombie (from left), Mabele Scott, and Gina Drake, sit near “Santa’s Cove,” on Almar Drive, awaiting the start of the parade. A crowd gathers near “Santa’s Cove” on Almar Drive, to get a up close and personal view of the parade. HERALD PHOTO BY JERRY BEARD “Santa” takes a rest in a hammock, supported by Palm Trees. Dale and Valerie Hofferkamp, of Springfield Illinois, are bundled up waiting for the beginning of the parade. The annual “Saturday Night Before Christmas Eve Boat Parade” was held along a four-mile stretch of canal in Punta Gorda Isles, at 6 pm, on Saturday, Dec. 22. The four-mile route began in “Santa’s Cove” on Almar Drive, and ended in the Yellowfish Lagoon, in the vicinity of Lodi Drive. Will you pay more for flood insurance?